The modern game is as much a soap opera as Coronation Street if that’s your thing. There are, despite the lobotomisation of modern professionals, still characters in the game willing to speak their minds or just be plain entertaining. Meanwhile on the pitch, amidst the oft dull and the desperate fare are moments of magic if you are brave enough to hang around until the final whistle. Then there’s the rich football fan subculture with it’s own community and humour. There’s a chance that 22 men kicking a ball around may yet cleanse our souls of the latest toxic FIFA corruption shenanigans. We need some positive news stories on the pitch – football owes us. There has been a lot of money flying around this year with three weeks of the transfer window to go. Money alone can’t buy success and that’s why I expect Alex Ferguson to steer Manchester United to yet another title. City and Chelsea have to somehow keep their overpaid and overpopulated squads happy now that they are limited to 25 players under FA rules. Liverpool, revitalised under King Kenny, will be an interesting proposition following a huge spending binge and eyes will also be on Arsene Wenger as the perennial also-rans of Arsenal face life without Fabregas. Once again there may be more drama at the other end of the table with the likes of newly promoted Norwich and Swansea setting out to finish 4th from bottom. Manchester United – Some senior pro’s have retired but assuming they land Wesley Sneijder I think the mix will be right for them to finish top again. Stoke – Like Skoda they initially became efficient and have since had the nerve to add some quality. Top eight? The days when you assumed clubs relegated from the Premiership would bounce straight back have gone. Relegated clubs tend to bring financial woes with them or underestimate how hard it is to escape from this division. The finances have started to bite many clubs and some that gambled on a failed promotion bid last season will struggle this time around as the purse strings are tightened. Leicester are bucking the trend as manager Sven throws millions at players in a bid to secure a top 2 finish. As a Derby fan I have to believe we will finish a lot higher than last seasons dismal showing. The squad looks stronger this season and there are certainly more leaders on the pitch but at the time of writing we need a midfield general, tall old-school striker and a left back not called Kilbane if we are to challenge for the play-offs. I’m hoping for top half. Leicester – Money doesn’t buy you promotion. OK, maybe it does then. Coventry – Struggling on and off the pitch. Peterborough – They punched above their weight last season. They will need to do it again. Barnsley – A lack of quality may tell. Brighton – on a roll with their new stadium, last seasons promotion and some quality signings. Stevenage – Where are the goals coming from? Notts County – Last season was about survival but manager “Mad Dog” Martin Allen has brought a new way of thinking to the club that may take them on a run. It would be nice if all the talk this season was of football and not finances. One thing’s for sure there will be plenty of neutrals looking out for AFC Wimbledon – a club reborn by purist fans after the MK Dons debacle. Also under the spotlight will be Crawley who spent astronomical money by non-league standards to leap into the football league. Shrewsbury – They play a lot of good football. If they can show some steel they will be well placed for promotion. Barnet – struggled last season and have lost players since. It doesn’t look good for them. Football’s back. Did it ever go away? Footballers. They’re over paid, over rated and over exposed. Even the most die hard fan would probably have more criticism than praise for the modern professional. That said, there is one sacrifice they do make. They don’t get much time away from the game. Best case scenario they finish mid April and return for training early July but some seasons they will lose much of this time negotiating transfers, moving house, etc. If a clubs is involved in the play-offs that’s another couple of weeks tied to the game. Meanwhile the better players will be turning out for their countries at major competitions like the World Cup every other year leaving them perhaps 2 or 3 weeks before starting over for the next season. There – that’s as much sympathy as they are going to get from me. We could be in for a real humdinger of a season with more teams than ever battling for top spot. Chelsea and Man Utd will go toe to toe but the Man City megabucks may finally start to tell. Liverpool under Hodgson will surely improve on last seasons fare while Arsenal are always in with a shout and Spurs – well – let’s not tempt fate. Blackpool will set the Premiership alight, at least off the pitch with Ian Holloway in front of the cameras. Eyes will also be on Mark Hughes at Fulham and Sol Campbell at newly promoted Newcastle. All will become clear. Chelsea – They were clinical last season where other contenders slipped up. I think this season may be similar. Blackpool – The gulf is toooo big. We would all love Holloway’s men to stay up, but really? Wigan – Can’t keep punching above their weight. This may be the season gravity kicks in. West Brom – We know they play attractive football but where is the steel they need at this level? If ever there was an odds-on favourite it has to be Middlesborough with their stellar squad and big money signings. The relegated clubs would normally be expected to challenge for promotion but Hull and Portsmouth have huge financial problems with Portsmouth potentially starting the season with a mere 15 professional players. Locally I see Leicester pushing for a playoff place along with Forest (hiss!) who will probably make plenty of news off the pitch as manager Billy Davies inevitably falls out with his board. My team Derby finished mid table after an at times precarious flight last season but I believe the club are progressing slowly but surely. Coach Johnny Metgod went to the World Cup with the Dutch as a scout and returned with dreams of a 4-2-3-1 formation. The Rams have adopted this pre-season to good affect and with last seasons massive injury list on the wain I predict a 10th place finish. Scunthorpe – Survived last season due to Hoopers goals but now he has left them. Watford – They seem to have reacted to last seasons mediocrity by selling lots of players and getting none in. QPR – They have spent stacks of money over a number of seasons but ruined it all by changing managers every 10 minutes. They may feature this time purely on the basis of having had some stability for a longer period. Sheffield Wednesday – Should bounce back to the Championship with the quality of signings they have brought in. Colchester – Finished 8th last season but have lost too many good players. Huddersfield – Have recruited plenty of good players close season but can they gel quickly enough? With Notts promoted last season Bradford are the team many would look to for automatic promotion but they underachieved last season and I wonder whether they will handle this seasons expectations. Sides newly promoted to the league tend to do very well which will provide encouragement for Oxford and Stevenage. There is a financial story every season and this year it is Southend fighting off HMRC. Administration and a points deduction could open the trap door to non-league football. Burton Albion – Looked good in their first season and have improved their squad over the summer. This win for glorious homeland Democratic Peoples Republic of Korea will show the imperialist west that we are superior in every way. The lads will be welcomed home as heroes for an open-top tank parade. All hail me! 1 min: Referee Howard Web has polished his head in an attempt to look like Pierluigi Collina. 17 mins: Ohh – ahh – no, almost! Throw in. 24 mins: It’s good to see some proper fouling. In too many games up to now we have seen yellow cards given for soft fouls but Van Bommel’s deliciously crude tackle from behind that took out his man plus the mans dog was a joy to behold and much better value for yellow. 28 mins: Just when we thought that was good along comes De Jong and applies his studs to Alonso’s chest a’la Gazza. Again – excellent value for a yellow. 30 mins: BBC commentator Cliche Watch: “There will be a new name on the trophy whoever wins“. REALLY?! 42 mins: Sneijder shows consumate skill to jams his studs into a Spanish midfielder without getting booked. Now that’s how you do it. 44 mins: Cliche watch: “Van Persie has fed on scraps in the first half“. Perhaps if he would stop eating and concentrate on the game he might have been more effective. Alan Hansen bemoans the fact that the game has been tight with lots of fouls and little flair on show. Yes Alan – it’s the World Cup final. This coming from a dour central defender whose playing career (and subsequent punditry career) was hallmarked by dull thuggery. 56 mins: Johnny Heitinga receives Hollands 5th yellow card – not for shooting as the felled Spaniard would claim – but for a something-and-nothing challenge. Not in Van Bommels class. 66 mins: Capdevilla clips the heels of advancing Van Persie to get his name into the book. Snidey and not nearly dangerous enough. 69 mins: David Villa picks up a loose ball 2 yards out and with the goal at his mercy manages to win a corner. 73 mins: Cliche watch: After a promising Spanish move is brought to a halt by a foul – “If Spain score from this it will be poetic justice“. 76 mins: Sergio Ramos fancies an extra 30 minutes judging by his open goal miss from a corner. 79 mins: Quote of the match – Spanish winger Jesus punts the ball over everyone’s head and out of play. Commentator: “That’s not his greatest cross“. True, but a little insensitive on a Sunday! 82 mins: Robben is through again and with just the goalkeeper to beat manages to emerge with a booking. 84 mins: Cliche watch: “We are at the stage where one goals means you’re world champions“. Erm, no actually. FULL TIME and Gary Lineker is clearly distracted – “If it goes to penalties it’s going to be a knee trembler“. I’m not sure if he’s talking about his own circumstances or whether FIFA have introduced a new way to settle tied matches. 92 mins: Three Spanish forwards dive simultaneously in the box. It’s beautifully choreographed. 94 mins: Fabregas wants penalties and so decides to miss when clean through. 95 mins: Mathaison also fancies pens so heads over from a corner when well set. Commentator to Clarence Seedorf – “How can Holland win this game now?“. Go on Clarence – just say it, please! 109 mins: Heitinga sent off for second yellow card. Nothing too malicious unfortunately. 110 mins: Van Der Weil booked for allowing Iniesta to blatantly dive. 116 mins: INIESTA SCORES! Two more bookings. 120 mins: Xavi booked for kicking the ball away. 121 mins: Torres makes his only contribution to the world cup by pulling his hamstring. 122 mins: The ref blows – it’s all over! Dutch players crowd around the referee to dispute something or other in an attempt to get some late-late bookings but it’s to no avail. Just the 14 yellow cards this game. Commentator: “Spain have won the world cup 1-0“. Really? Thanks for that – none of us had been watching. Alan Hansen: “The goal was scored by Iniesta – the best player of the tournament“, which seems odd since Hansen hadn’t mentioned this up until this point. Gary Lineker: “A victory for football I think“. Bingo! Let’s wrap a few things up before I call time on my world cup blog. The blog banner graphic includes the following footballing folk, in case you hadn’t already worked it all out. Statto, aka Angus Loughran, who was declared bankrupt in 2008. Carlton Palmer – former England international in all but ability. John Barnes – famous for his rap song and shiny suits. And failed management career. And crap punditry. He used to be a decent footballer mind. Stan “The Man” Collymore & Ford Cortina. Unfortunately his dogging notoriety is far from the most shameful incident in his career. Paul “Daft as a brush Gazza” Gascoigne. Just when you thought his life couldn’t get more screwed up he arrives in Rothbury to provide his good friend the deranged murderer Raoul Moat with his last supper. Pity his agent who he shares with Roger Mellie. Thanks to all of my guests. BTW: Who’s going to pay for the massive biscuit and cake bill? And this poodle is going for a walk “down by the canal” tomorrow. No thanks to the jobsworth “celebrity” agent who tried to close down my blog on the grounds that it somehow posed a threat to his D-list client. Apologies to my non-footballing readers for the last months output – normal travel/baking service will be resumed forthwith. By my calculations there were 736 players at this years World Cup finals. Statistically that means 61 one of them will be a year older at the end of the tournament than the beginning. I suspect many more than this will feel that the World Cup has been going on for a year. Can we just have the final please? Everyone had been looking forward to this clash but I thought tonight I would let the fans do the talking. We have staunch German fan Fritz and Uruguayan supporter Carlos here to talk us through this exciting third place play-off match. The match was end-to-end with countless chances for both teams. Carlos, your team went a goal down but then fought back to take the lead. Did you think Uruguay were going to win at that point? I don’t know. I didn’t watch the game. I took the dog for a walk and when I got home I watched Uruguay’s Got Talent instead of the second half. Who won then? Urm, well Germany did. They showed real heart to come back after losing the lead to win. Fritz you must be very pleased with your teams performance. Ja, my neighbour told me we played very well. I was washing the car but he kept telling me the score. Well you both missed a great match. Forlan almost equalised at the end – it could all have been so different. It’s a shame you missed it. So Carlos, who won Uruguay’s got talent then? Please tell me it wasn’t that singing Llama. That’s a complete load of rubbish but the audience seemed to love it last week. Did you know that most Spaniards are allergic to vegetables? While Columbus and Drake brought potatoes and exotic fruit back from their travels to new lands the Spanish explorers of the age sailed back to their King with ostrich steaks and turkey twizzlers. Fussball’s komming home! Ze ladz done gut. Eine match left jetz – Spainland against Holland. For zis very komplicated prediktion I haff much thought over. Spain zey are ze favouties, no? Holland ze underhounds. Ah – hier ist mein assessment. Ze vinners of the 2010 world mug vill be Holland! Ja – naturlich. Zey haff done just enough every time und Sontag zey vill do zis also. Die Grossen Frau sings soon! Vat else than Dutch Apfel Kuchen? What is the point? Really. After several weeks away from home two teams have narrowly failed to make the final just when they are dead beat and want to get on a plane they have to play one more match to ascertain which of them is the bigger loser. The players just want to go home and many of the supporters don’t really care. OK, rant over. The good points. The unlikely appearance at a match in South Africa between Germany and Uruguay of an England flag behind one goal with “Chesterfield” written on it. The opportunity to debunk the ridiculous notion that an octopus can predict the result of a football match. The sound of Suarez (the guy who cheated Ghana out of a win with his last minute hand ball) getting booed every time he was on the ball. This was the only time you could hear fans above the vuvuzelas. Another chance for Joachim Lowe to show off his wardrobe. This time a fetching Mourinhoesque scarf. The sight of two teams who, at last, play with free abandon because they have nothing to lose. Against all odds it turned out to be one of the most entertaining games of the tournament. If you backed the prediction of Paul the psychic octopus at the bookies you would be squids in. He predicted a Spain win so the calamari is on hold, for now at least. This was never going to be the 90 minute classic some people were expecting. Spain held the majority of posession but looked unclinical in the final third. Germany were solid but their ocassional thrusts were met with the sort of reliable defending they hadn’t yet encountered in this competition. Spain had the best of the few chances that were created and it was no surprise that the goal when it came was scored by a central defender – Puyol heading home from a corner. They should have doubled their lead when through 2 on 1 but Pedro reverted to Spanish sterotype by trying to beat the solitary defender instead of squaring to the spare man. Ultimately it didn’t matter – the Germans rarely troubled Casillas in goal and can have no complaints. So now we know how the the finalists and whether Spain or Holland come out on top on Sunday we will have new World Cup winners – neither have lifted the trophy before. Spain beat Germany. Blah blah blah. 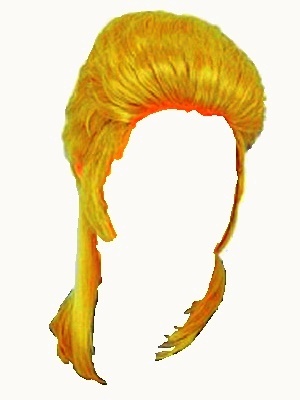 The really big news is that I am now about to announce the winner of the World Cup Golden Mullet competition! 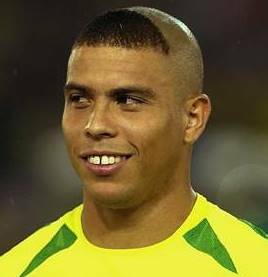 Back on June 20th I asked you to choose your top three worst ever hair disasters in World Cup history from a choice of 12 contenders. The moment of truth has arrived and I can announce the top three worst hair happenings as chosen by an expert judge (me). 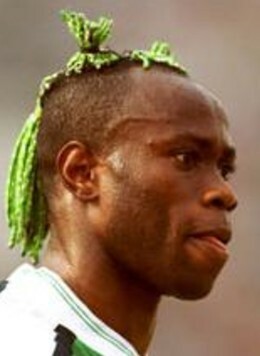 In third place I have chosen former Nigerian defender Taribo West. Don’t get me wrong, we are talking about not only a very fine footballing talent but a true humanitarian responsible for great acts of charity and compassion towards his less well off fellow countrymen. Good deeds can only go so far however and there can be no defence for this hairstyle homage towards a little girl’s doll. 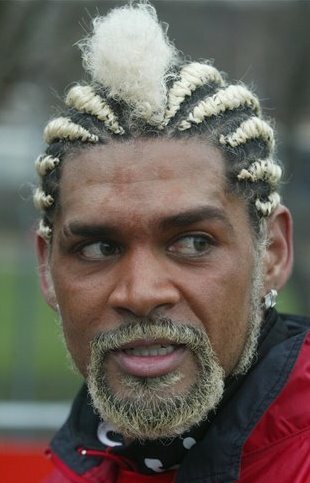 Second place Goes to the former Portugal and Everton enigma Abel Xavier. What can you say about the calimatous coiffure that you see before your eyes? What exactly (or even vaguely) was he trying to achieve? You see this is only part of the story. The lad has form – he’s had more bizarre hair arrangements than Avram Grant has had massages. I think it just comes down to the fact he wasn’t that great a player so had to make the news in different ways. In this judges view first place is firmly taken by none-other than beaver toothed pie fancying Ronaldo (the original Brazilian one – not the car crashing, dive meister from Portugal). What can you say about this, this – thing. I’m genuinely trying to say something incisive or witty but for once words truly fail me. There may be some logic. Perhaps he thought that a totally dumb-assed removal of hair from the forehead back would distract people from his unfortunate teeth. However, the net result is that you notice both of these features instead of just the one. The knob. Congratulations go to our winner Jim Patraeus of New Bedford MA. Jim didn’t agree with my ratings – in fact he didn’t actually enter the competition at all – but he did ask me for advice about a washing line, which was the closest thing to a competition entry that I received. Jim “wins” the fabulous prize of the ball that has been in my garage for a few years. 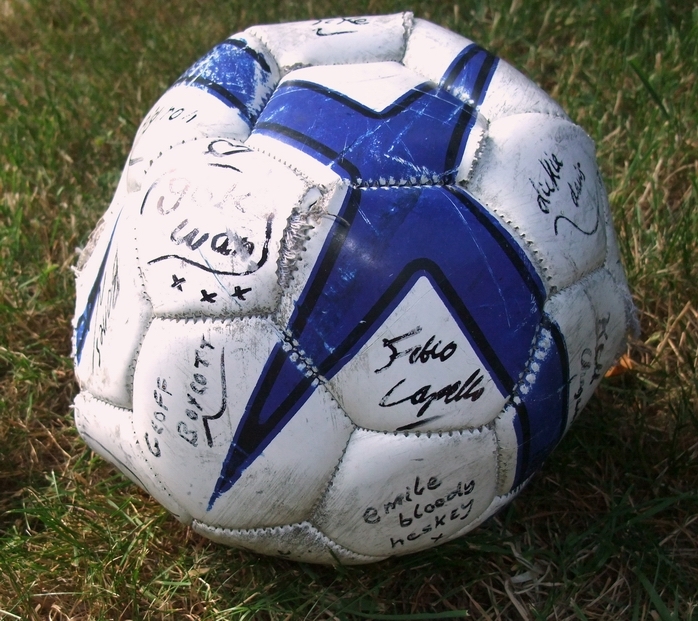 As promised I have faked a number of footballing signatures on the ball plus – for Jim’s personal appreciation – some Stateside tags: Abe Lincoln, Bill Shatner, Elvis and MC Hammer. The ball would be in the post if I had your address but instead it’s back in my garage. Eat your heart out Jules Rimet. Ooh – some football just happened! Holland won this encounter by three goals to two. They scored one more goal than Uruguay and under the rules of football that means that they progress to the world cup final while Uruguay do not. Had this not been the score it is possible that the consequences for both sides would have been different but nobody can argue that the result speaks for itself. It was a game in which both sides scored. On a different day there could have been more goals – or less – but fate decided tonight result. Holland were most likely playing in Orange with Uruguay probably in Blue. The first half saw both sides trying to score against the opposition and there were doubtlessly some occassions when defending was called for in order to counter the attacking teams intentions. Things changed around at half time with each team kicking the other way. Neither manager chose to change tactics after the break with both Holland and Uruguay singlularly focussed on scoring and yet not conceding. Towards the end of the game the tension ramped up as Holland held onto their goal lead while Uruguay attempted to equalise in the attempt to force 30 minutes of extra time and then perhaps penalties, but the Dutch held out for the win. After the match the Dutch players were very happy while the mood in the Uruguay camp was rather low. I would imagine that if asked about the teams appearance in Sundays world cup final the Dutch players would say they are looking forward to it and they believe they can win. Tomorrow we find out who the opposition will be when Germany take on Spain. Now that’s a match not to miss. No siree – we won’t be missing THAT match. Definitely going to tuning in for that one. Oh yes! Germany really are the footballing machine they are made out to be. In the last 14 world cup tournaments their record is: Champions 3 times, Runners up 4 times, semi-finals 3 times and Quarter Finals 3 times. Only in 1978 did they suffer the relative ignomony of getting knocked out in the quarter finals – like England this year. Welkommen again fussball volk. Mein towel ist already on ze footballing seat. Are you ready for “das big daddy spielen” tomorrow? It ist irrelevent how you feel. Fools. There are facts only in this matter und ze facts are that Germany are “hot to trotting” as you Englanders say. Ja, Spainland vill feel ze embarassment of failure before the might of my people. On ze night it vill be wiesswurst, nicht chorizo. It vill be Becks nicht San Miguel. It vill be Kraftwerk nicht Julio Igelsias. VW nicht Seat. Hanggen on, zey are die same no? Crumbs because I have zis kuchen now eaten gobbelt. Adios! Erm – sorry missed it. Was it a good match? Holland have a curious World Cup record. They have failed to qualify on 7 of the last 14 occasions while making it all the way to the finals twice and semis twice. This is a very Dutch characteristic due in part to their complex psychological make-up and duality of mindset but predominantly their innate insanity. Vat could be more naturlich – ein grosse portion of Orange Drizzle Cake for mit scoffen, nein? Holland against Uruguay. Let’s be honest, it doesn’t have quite the same ring about it as Spain vs Germany. Can’t we just put Holland in the final and get on with it? Holland are going to win after all. Whoa – hold on! In all probability Holland will win but unless they are 3-0 up in 20 minutes there will be sufficient doubt about the result to hold our attention. Don’t forget how close Paraguay were to putting Spain out of the competition. Even if a shock result is never on the cards there is still the potential drama of a booking putting a player out of the final. Imagine the trauma of a player getting a card 5 minutes from time with their team 2 goals up, with the sudden realisation they are going to miss the final. It’s not life or death but somehow it seems as large. There’s also the fact that both teams will be desperate to win and unless it’s all square going into the end phase of the match the losing team will be throwing themselves forward leaving great counter-attacking possibilities for their opponents. It could yet turn out to be the game of the tournament. Still feeling 100% confident in Holland? Uruguay were due to meet Yugolsavia in their first match – the first to feature any of the South American teams. Apparently the Yugoslavs sent spies to the Uruguayan team’s training session but the players noticed this. They began falling over each other and deliberately kicking the ball badly, so much so that the spies reported that these South Americans did not know how to play soccer. On the day of the match, the Uruguayan flag was raised the wrong way round and a Brazilian march was played instead of the Uruguayan national anthem. The third mishap was that Uruguay ran rings around Yugoslavia and beat them 7-0. It’s a sweet story from an innocent time. Could this also have been Fabio Capello’s plan? Did it backfire when England forgot to stop playing like idiots when they met Germany? Maybe the truth will out in 80 years time in the morning edition of the African Sporting Gazette.